Deer can cause major damage to yards in any season, but in winter they can be downright deadly to some of the most expensive backyard landscape plants. 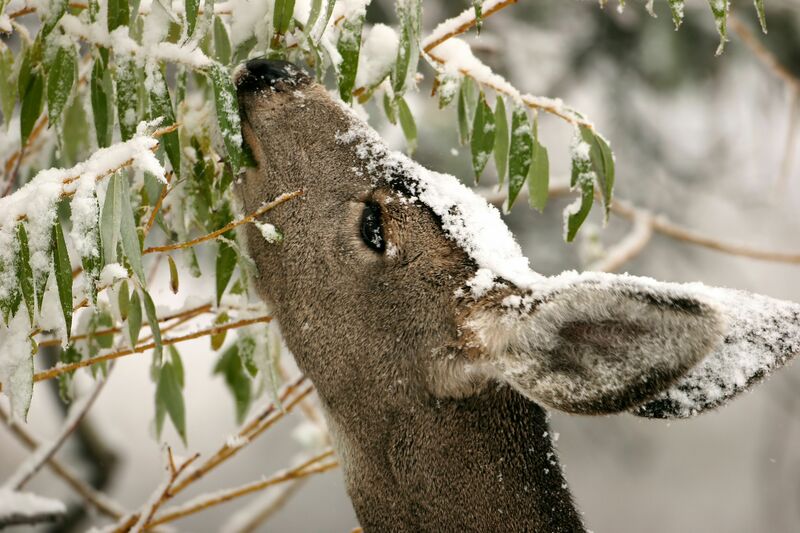 When regular foods like leaves, grass and annuals become scarce, deer turn their attention to woody plants, shrubs and trees that stay green in winter, like rhododendron, arborvitaes, yew, holly, and those that lose their leaves, like oak, willow and dogwood trees. Deer will tear away at the lower leaves and branches of these shrubs and trees, which won't grow back evenly and may be permanently damaged, in need of replacement, come springtime. Arborvitaes and other landscape shrubs and trees can take years to grow to maturity. They're also the foundation of your backyard's beauty. Deer damage in winter can add up to a big budget-busting bill to replace plants, not to mention negatively affecting the beautiful aesthetics of your yard and garden. Because food is scarce, and high deer populations mean more competition for food, deer are likely to be more resistant to efforts to evacuate them. They'll return to areas where they found plentiful pickings in warm weather, and be more inclined to stay put until an area is stripped clean of all possible food sources. A single adult deer eats about 12 pounds of foliage a day and does usually occupy the same 3- to 4-square-mile area for their entire lives. During her lifetime, a doe will procreate every year, having as many as two or three fawns at a time. If you've had deer in your yard before, it is more than likely your yard is on their list to forage and is at risk this winter. 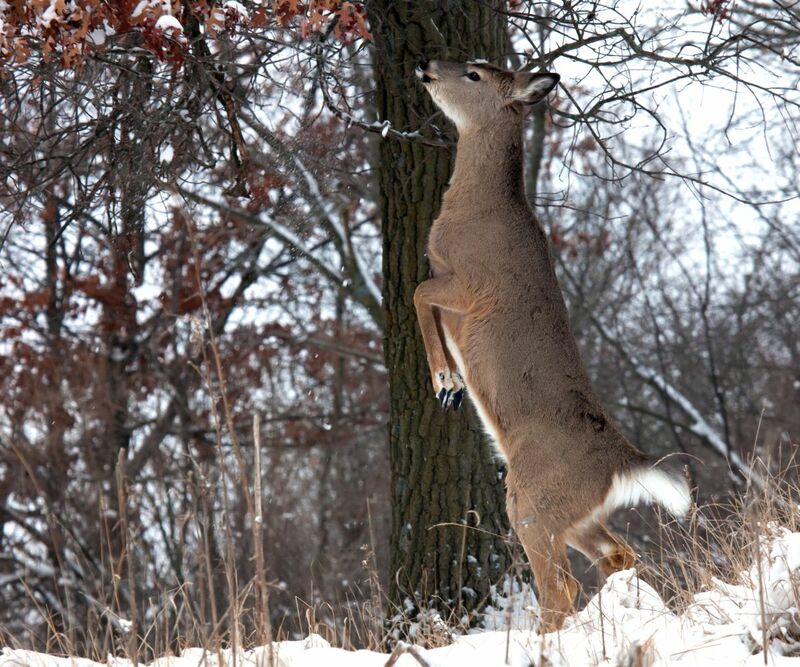 Homeowners need to be proactive and prevent deer damage during winter. 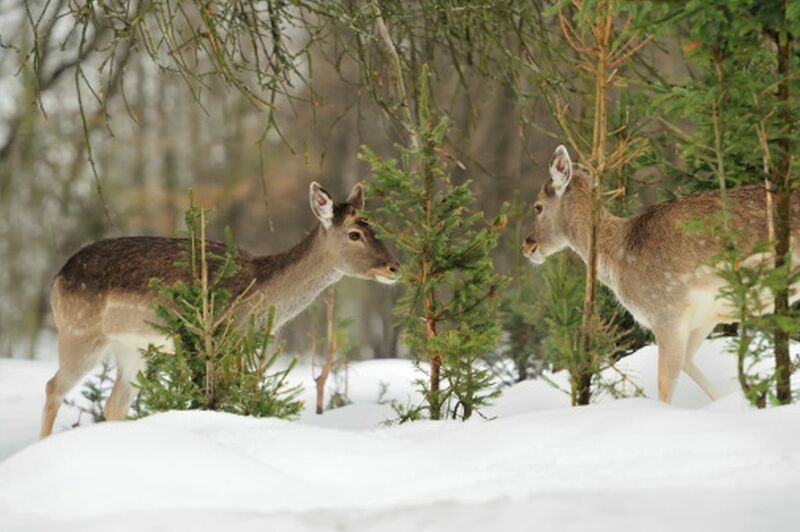 No one wants to be faced with the expense of replacing deer-damaged shrubs or trees. Fencing can be effective if the fence is higher than deer can jump (at least 8 feet), but many suburban areas limit fence heights. Even if your neighborhood allows a high fence, building one is expensive and can be unsightly. Some homeowners turn to a range of "home remedies" intended to be harmless to deer, people and pets. However, remedies like pepper spray, soap or predator urine may be harmless but rarely deliver reliable results for deterring deer. Commercial repellents may not have been third-party tested for efficacy, or they rely on harsh chemicals that may be harmful to the environment, pets and other landscape plants. To be most effective in winter, when deer are desperate, repellents should be applied in fall, and continually reapplied as needed, throughout the cold months. Using a repellent all year, conditioning deer to skip your yard, is always your best bet. An independent study conducted by The Connecticut Department of Forestry tested ten commercially available deer repellents to determine the most effective deer repellent. Bobbex Deer Repellent was ranked #1, scoring a 93 percent Protective Index. Bobbex is a topical, all-natural foliar spray which prevents deer, moose and elk from browsing and damaging ornamental plantings, shrubs and trees. Bobbex's natural, active ingredients are a series of proteins that make the product safe for the environment and for use on even the most sensitive foliage. The product mimics predator scents which deer have an aversion to and is classified as a fear repellent, but it also tastes bad to deer, adding another layer of protection for plants. Because it contains effective sticking agents, the repellent won't wash off, even in harsh winter weather. Left undeterred, deer can strip bare your landscape's most expensive and susceptible plantings, leaving you with an unattractive yard and high repair bills when warm weather arrives. Taking proactive, preventive steps can help ensure deer learn to leave your yard alone throughout the winter, and with continued use, keep them at bay, all year long.